EXTRA COLOURS: If you want a bespoke RAL colour you must state this in the comments field when placing your order and we will then contact you for more details. Note this can take up to 20 working days and is an extra 10% on the net price. 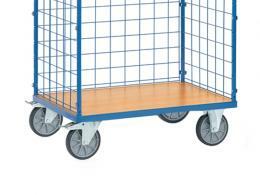 Parcel trolleys have the advantage of an all-mesh construction allowing you to view the goods in the trolley. This is particularly useful in warehouses and stock rooms as it eliminates the need to rifle through boxes or continuously open and close containers to find a particular product. A trolley cart such as this unit is also incredibly useful for storing cardboard boxes and other recyclable materials in an orderly manner. 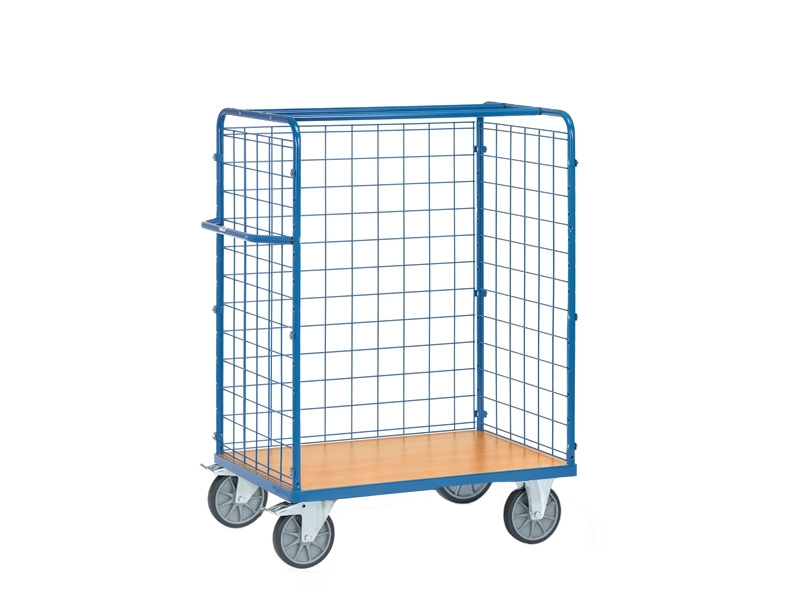 These parcel carts are available in a variety of dimensions and configurations making them ideal for all workplaces, warehouses and offices. What is the purpose of the Parcel Cart Without Doors? The Parcel Cart without Doors is designed to carry packages and other bulk mail items. Construction of the cart is composed of tubular and sectional steel. This heavy duty trolley is welded and bolted together for lasting durability. The platform is composed of beech grain and the cart can carry a maximum weight of up to 600kg. The diameter of the wheels is 200mm and 2 of the wheels can be fixed with a brake for stationary tasks. A handle is located on the side to aid this pull along trolley in being moved with ease. The open front is convenient for stacking boxes and other materials. The wire lattice of the cage measures 100mm x 100mm x 5mm. The parcel cart can be used in mail rooms and sorting facilities. The design is great for storing packages and boxes for mail deliveries. Vans and trucks can be loaded with ease. The open front makes loading and unloading easy. Warehouses can use the cart to move heavy materials and supplies between departments. Who might use the Parcel Cart Without Doors? Warehouse or sorting facility personnel will utilise the parcel best for everyday tasks. 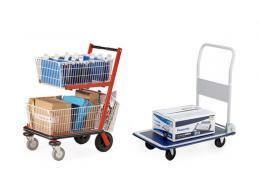 The cart is easy to move through the handle on the side of the unit, making it an ideal site trolley. The braking system is great for stationary tasks like moving boxes and materials to another location. Mail rooms in companies can also move packages to different departments. The parcel cart is manufactured by using the best products. The unit is very durable and sturdy under normal work conditions.